Notes from our senior physicist. So what's a Physicist doing in a Hospital, anyway? I get this question often from well-meaning individuals. Being a reasonable question -- because one may not associate physics with patient care -- it deserves a thoughtful response. Fact is, some of the most dramatic developments in medicine originated in physics, and many applications continue to be driven by physics. 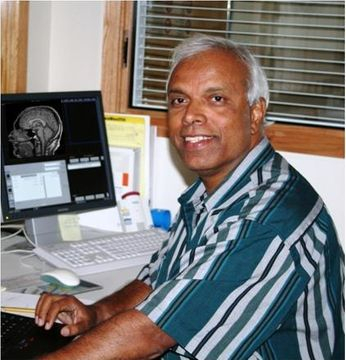 These include Computed Tomography (CT), Magnetic Resonance Imaging (MRI), Positron Emission Tomography (PET), Single Photon Emission Computed Tomography (SPECT), high energy Linear Accelerators (LINAC), Cyclotrons, Lithotripsy, Ultrasound Imaging, Anger Camera, Light Amplification by the Stimulated Emission of Radiation (LASERs) and Electron Microscopy, to name a few. Discovery of radiation (as in radiation therapy), electrons, protons, X-rays, neutrons, radioactivity and the structure of DNA compliment the list. In some clinical areas, physicists play a significant active role. They can be found working not only in Research and Development enhancing our knowledge and understanding, but also in Medical Imaging and Radiation Therapy performing the day to day clinical duties. Modern hospitals harness complex physics concepts for state-of-the-art diagnosis and treatment. A lot of the physics can be “packaged” and a “flesh and blood” physicist need not be present to perform these studies. For example, a routine thyroid uptake study uses Nuclear Physics. But they have been packaged well enough that a trained technician can perform the study -- he or she need not even understand all the physics behind the procedure. Likewise, an ultrasound unit that peers in to a human body uses complex physics, but it has been so nicely packaged that a physicist is not needed to take an ultrasound image! However, some of the frontiers of medicine are so new that they have not yet been packaged, necessitating the involvement of a skilled physicist. This is the prevailing situation in many aspects of Medical Imaging and Radiation Therapy. Of course, as technology marches along, more and more of these procedures will become packaged (think robotics and intelligent software among other things) with a concomitant decline in physicist involvement. A case in point is Computed Tomography. In 1976, when I was at the National Institutes of Health, we had one of the first EMI head scanners in the world. It used NaI(Tl) scintillation detectors optically coupled to big PM Tubes, and huge aluminum bow tie filters in the source assembly. A physicist with knowledge of Nuclear Physics, Pulse Height Spectral Analysis, radiation detection and associated Instrumentation was essential for generating an acceptable CT scan. Shortly thereafter, CT technology became so far advanced that a physicist wasn't necessary for a routine CT scan. What’s more, even in a most demanding and quality conscious department, his work on the CT today amounts to a couple of hours per week, where he examines the performance of the system based on established bench marks and tested daily by the CT technologist. Similar packaging is in place for MRI and SPECT as well, reducing the workload of the physicist. In the absence of such packaging -- whether it be due to the newness of the procedure or it’s sheer complexity -- it is vital that the physicist take an active role. Proton Therapy is just one such example.